Below is a listing of the books in my library that I’ve used as references in compiling this site, and to help create the many pysanky on its pages. I have a fairly extensive library, and will someday, I hope, get around to cataloging all of it. In the meantime, it is what it is. 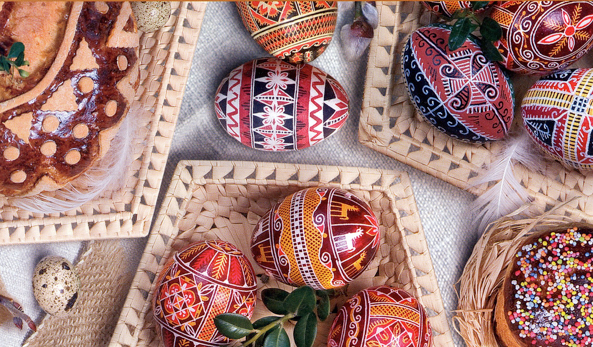 Besides books in English, Spanish, German and Ukrainian about pysanky, I have books on other types of Slavic decorated eggs, and on egg decoration in general. I have books of motifs, and books about motifs. I also have books about Ukrainian history (with an emphasis on the Trypillian culture, an area of interest of mine), ethnography, folk customs, handcrafts and mythology. There are children’s books, a pysanka movie and how-to videos. I have piles of magazines with articles about pysanky. And, of course, there is a book about snowflakes. I have photos of these books and reviews of them in my Books section (an annotated bibliography). You can click on any of the underlined titles below to go to directly to that book’s page, or you can click on a section title to go directly to that section. Pysanka books which are in non-slavic languages will be placed in the “Pysanka” section. Books that are mostly in Ukrainian, but may have an introduction or limited amounts of text translated into English, will be placed in the «Писанка» (Ukrainian) section. Fully bilingual books will be mentioned in both sections. Books available in multiple languages will have separate entries in each applicable section (if I own both copies of the book; if not, mention will be made). NB: This is still a work in progress; I’m slowly adding in books, even as I am collecting more of them. New Ukrainian pysanka books are multiplying like mushrooms after a rain. It’s a Sisyphean struggle!